Saxophonist, multi-instrumentalist, composer, and arranger; born on 9 September 1939 in Warsaw. Zbigniew Namysłowski is a gradute of music schools in Kraków and Warsaw, he learnt there how to play the piano and then the cello. He made debut in 1957 in Student Club Hybrydy and then at the Jazz Music Festival in Sopot. He played the trombone in famous Polish dixieland bands. After, he discovered modern jazz and started playing the alto saxophone. He performed in all European countries and in the USA, Canada, India, Australia, New Zealand, Cuba, Mexico, Brazil, Kuwait and South Africa. He recorded almost 30 author's records. Many of them were published abroad, ex. : Lola (1964) the first Polish record published abroad or Song Of The Pterodactil with famous drummer Tony Williams. Records Winobranie (1973) and Kuyaviak Goes Funky (1975) became super jazz hits in Poland and were voted the best records of all times in Polish jazz. He debuted as a jazz pianist in 1955 with the Five Brothers band formed at the Hybrydy student club. A year later, he joined Mieczysław Wadecki's amateur Dixieland band as a trombonist, and then transferred to the Modern Dixielanders of pianist Witold Krotochwil. In 1957 he joined Modern Combo, Krzysztof Sadowski's band, as its cellist, appearing with them at the Jazz Festival in Sopot. He returned to the trombone in 1958, collaborating with the band Hot Club Melomani with whom he took part in a historic event - the first ever jazz concert at the National Philharmonic in Warsaw. He also took part in the first post-war visit to Western Europe by Polish jazzmen. In subsequent years he collaborated with such well-known formations as the Polish All Stars, Modern Dixielanders, Traditional Jazz Makers, New Orleans Stompers, and Modern Jazz Group. In 1960, he gave up traditional jazz. He also started playing the alto saxophone which soon became his leading instrument. He was with Andrzej Trzaskowski's band The Wreckers until 1963, travelling to the United States for the first U.S. concerts by a Polish jazz band, taking part in the prestigious festival in Newport in 1962. At the same time, he fulfilled his own artistic plans. 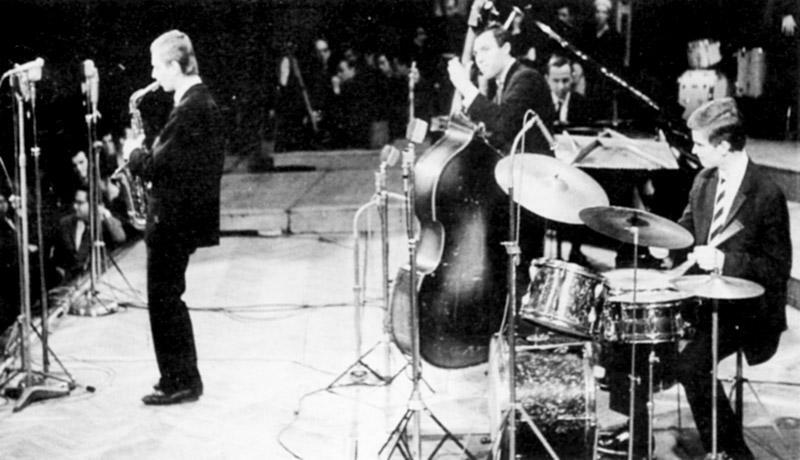 He founded his first major band, Jazz Rockers, in 1961, and further bands in subsequent years (mainly quartets and quintets), working with such great jazzmen as Włodzimierz Gulgowski, Tadeusz Wójcik, Czesław Bartkowski, Adam Matyszkowicz, Janusz Kozłowski, Roman Dyląg, Jon Christensen, Stanisław Cieślak, Tomasz Szukalski, Paweł Jarzębski, Kazimierz Jonkisz, Wojciech Karolak, Sławomir Kulpowicz, Janusz Stefański, Kuba Stankiewicz, Darek Oleszkiewicz, Jose Torres, Janusz Skowron, Zbigniew Wegehaupt, and Cezary Konrad. He has performed with Leszek Możdżer and Zbigniew Wegehaupt since 1993. In 1978 he travelled to the United States where he gave concerts mainly with Michał Urbaniak and Urszula Dudziak, returning to Poland two years later. He performed at the Polish Radio Jazz Studio, with the Chałturnik Association in Support of True Creativity (SPPT Chałturnik), Jan Ptaszyn Wróblewski's group as well as working with the Novi Singers during their tour of India, New Zealand and Australia, and the bands Niebiesko-Czarni and Niemen Enigmatic. With his own bands, he performed at all the major jazz festivals at home and abroad, for example taking part in almost all the Jazz Jamborees. In all, he has performed across Europe and in the United States, Canada, India, Australia, New Zealand, Israel, Cuba, Mexico, Brazil, Kuwait, and South Africa. He has been a composer since the 1960s. He likes to combine jazz with ethnic and classical music. His compositions include Piątawka, Siódmawka, Zabłąkana owiecka, 1.2.3.4..., W to mi graj, Bop-Berek. In recent years he has recorded CDs with a highlander band and jazz versions of the music of Wolfgang Amadeus Mozart (Mozart in Jazz, 1999; Mozart Goes Jazz, 1999; and Jazz & Folk - Namysłowski Quartet & Górale, 2000). His discography includes more than 30 original records, many of them released in other countries. The first Polish recording published outside the country was Lola, released in 1964 in Britain, while albums such as Winobranie and Kuyaviak Goes Funky became jazz hits and were recognized by "Jazz Forum" magazine as the best records of all time in Polish jazz.